NICE Electric gate automation kits, Barriers and Bollards. NICE Hyppo (Electromechanical) Articulated Arm Kit . Mechanical motors suitable for large pillar applications from 1.8m to 3m each leaf. 240 & 24v up to 800 kgs per leaf. 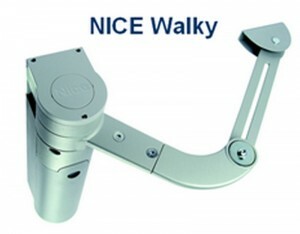 NICE Pop (Electromechanical) Articulated Arm Kit . Mechanical motors suitable for large pillar applications from 1m to 2m each leaf. 24v up to 250 kgs per leaf. Swing gate motor for, for leafs up to 1.8m. NICE Robus 350 Sliding Gate kit. Mechanical motors suitable for domestic applications. 240v up to 350kgs per leaf. 240v up to 1000kgs per leaf. 240v up to 2500kgs per leaf. NICE Spinbus Garage Door Kits. For sectional garage doors up to 10.5m2 and up and over garage doors up to 11.8m2.